A skillful actor can forge a powerful emotional connection with an audience. We soon forget that the performer is portraying a character, and the stage and props fade from view. When the character feels pain, we feel pain. When the character rejoices, we rejoice. 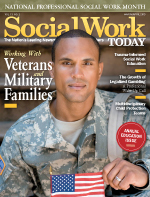 Skillful social workers can create a similar bond and engage clients in ways that overcome the distrust, anger, and bitterness clients may hold against those in the helping professions. This engagement is particularly important for child welfare caseworkers, who must frequently overcome the perception that their job is to take children away from families. An organization that trains caseworkers in Wisconsin has found a way to tie theater and social work together. For the past several years, the Milwaukee Child Welfare Partnership for Professional Development, which is part of the University of Wisconsin-Milwaukee’s Helen Bader School of Social Welfare, has partnered with a local theater group to use actors to portray clients during training sessions for new staff at the Bureau of Milwaukee Child Welfare. The gritty reality that professional actors bring to their portrayals of clients provides a unique and effective learning experience. Along with training incoming caseworkers, the program is contracted with the Bureau of Milwaukee Child Welfare to provide continuing education, supervisory development programs, and foster parent training. After becoming aware of medical schools’ use of actors to train doctors to better engage with patients, the partnership decided to try the same approach with caseworkers. That decision led the program to In Tandem Theatre, a theater company based in Milwaukee. Actors from In Tandem are used in two general areas of the training curriculum: teaching engagement skills and teaching case planning. Regarding engagement, caseworkers spend three days learning skills such as validation, reframing, and recognizing strengths, then spend a day practicing with actors. And once they’ve completed three days of learning with the Bureau of Milwaukee Child Welfare’s case-planning model, they do portions of planning interviews with actors. After all engagements with the actors, caseworkers receive feedback from peers, trainers, and those same actors. This culminates in an evaluation in which each caseworker does a portion of an interview with an actor for an evaluation panel. The clients whom the actors portray are based on case scenarios included in the curriculum. For example, Wilma is a 25-year-old mother with three children and a history of substance abuse and prostitution. Daniel is a 38-year-old single parent struggling to make ends meet and find the time to address his teenage son’s severe depression. Mario is a 17-year-old boy who has endured 25 different relative and foster home placements. Using the actors eliminates many of the issues that can make traditional role-playing exercises between peers ineffective, Brown says. There’s no monotone reading of scripts, giggling between participants, or breaking of roles between client and worker. “It’s very much like it’s going to be out in the field. It’s live action,” she says. The actors receive the case scenarios ahead of time and can use the facts of the case as a basis for their characters, but much of their performance is improvised. The actors’ purpose is not to be obstinate but to challenge the caseworkers in a way that facilitates learning, says Jane Flieller, In Tandem’s managing director. Each performance is tailored to the reactions of the caseworkers—how they speak, their body language, and their mannerisms. Engaging with the actors often can be nerve-wracking for caseworkers going through the training, but most eventually characterize the experience as one of the most valuable parts of their preparation for working with clients, Brown says. The experience gives caseworkers the opportunity to practice real-world scenarios and correct mistakes before going out into the field. Amy Gauthier, BSW, was required to complete the partnership’s training course when she took a job as an intensive in-home case manager with Children’s Hospital of Wisconsin Community Services, which works in partnership with the Bureau of Milwaukee Child Welfare. Having been exposed to many role-playing exercises while pursuing her undergraduate degree, Gauthier expected the experience with the actors to be the same. Another advantage the actors have over peer-led role-playing exercises is that they never break character during the activity, which means students do not have an “easy out” and must follow through with the client, Gauthier says. The experience has been transformative for more seasoned social workers as well. Robin Matchett-Schmidt, MSW, CAPSW, worked for the Bureau of Milwaukee Child Welfare for six years before taking on a new position that required more training. Matchett-Schmidt found that the actors’ perspectives provided new insight about how she presented herself as a social worker. Brown hopes the success of the collaboration between the partnership and In Tandem Theatre provides a model for other jurisdictions to follow. Chris Flieller, In Tandem’s artistic director, agrees, noting that he has a newfound respect and gratitude for social work based on what he’s seen in the training sessions.